Hit Drama “Story of Yanxi Palace” Source: iQIYI, Inc.
USPA NEWS - iQIYI Inc., an Innovative Market-Leading Online Entertainment Service in China, on August 31, celebrated the Conclusion of its Mega-Hit Costume Drama "Story of Yanxi Palace," a Qing Dynasty Tale of Scheming Concubines and Palace Intrigue. Having captivated a Nation, the 70-Episode Series - Co-Produced by iQIYI and Huanyu Film Works - has at its Conclusion been streamed a Total of over 15 Billion Times. iQIYI Inc., an Innovative Market-Leading Online Entertainment Service in China, on August 31, celebrated the Conclusion of its Mega-Hit Costume Drama "Story of Yanxi Palace," a Qing Dynasty Tale of Scheming Concubines and Palace Intrigue. Having captivated a Nation, the 70-Episode Series - Co-Produced by iQIYI and Huanyu Film Works - has at its Conclusion been streamed a Total of over 15 Billion Times. Over the Course of its Pun, the Wildly Popular "Story of Yanxi Palace" has been the Undisputed Entertainment Sensation this Year in China. The Show was the Most Watched Online Drama in China for 39 Consecutive Days this Summer, being streamed an Average of 300 Million Times a Day, on its Peak Day receiving a Record breaking more than 700 Million Views. 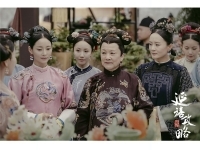 On Major Chinese Twitter-Like Social Networking Platform Weibo, "Story of Yanxi Palace" rose to the Top of the Site's "Hot Searches" List 500 Separate Times, while Total Posts using the Hashtag "#Story of Yanxi Palace" received over 12 Billion Views. In the Wake of the Show's Popularity, Chinese Media have reported a Significant Increase in Visits to the Show's Eponymous Yanxi Palace within the Forbidden City. Following the Show's Enthusiastic Reception Domestically, "Story of Yanxi Palace" has also Crossed Language and Cultural Barriers to reach Significant Success Outside Mainland China, and is now Viewable in over 70 Countries and Regions. The Show has been distributed to Major TV Channels and Platforms across Asia , being the Most Watched Program in Hong Kong on TVB in its Second Week of airing. The Show has also proved Immensely Popular Outside Asia, becoming one of the most Watched Licensed Chinese Language Dramas on Youtube this Year.